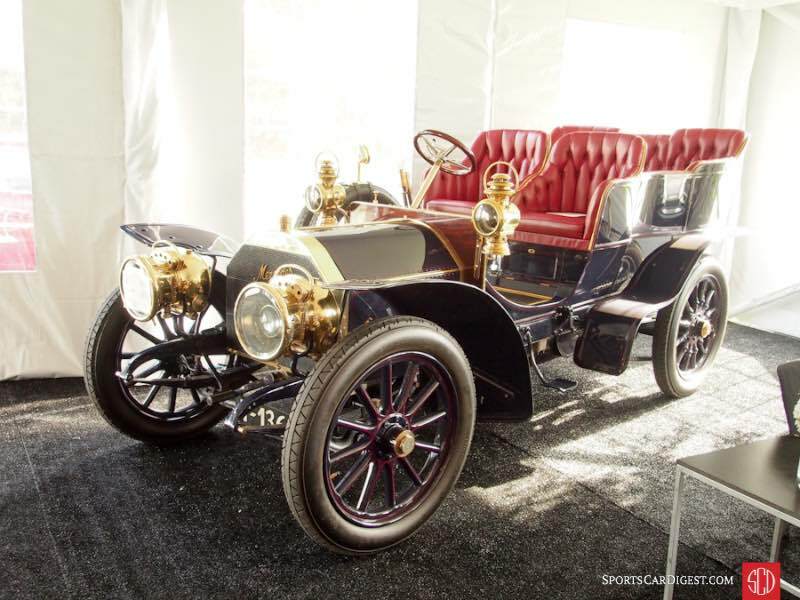 Lot # 27 1904 Mercedes-Simplex 28-32HP Rear Entrance Tonneau; S/N 2406; Engine # 4309; Royal Blue, Red coachline/Red leather; Estimate $2,500,000 – $3,000,000; Older restoration, 3+ condition; With Reserve; Hammered Sold at $2,550,000 plus commission of 10.00%; Final Price $2,805,000 – RHD. B.R.C. bullseye acetylene headlights and kerosene sidelights, double chain drive. – Known history from new with a reproduction body in the early 80’s after years on farm service in the UK hauling pig swill and as a stationary power source. VCC dated and multiple LBVCR participant. Good paint, brass is good but needs to be polished. Good upholstery. Chassis shows age but is better than just serviceable. Runs strongly and drives very well. – Sold by Brooks in London in 1999 for GBP 265,500 ($427,192 at the time) when it was at least as good as it is today, a delightful, powerful, commodious vehicle of impeccable quality. This is one of the quick – but expensive – ways to get from London to Brighton on a nasty November day. And who says buyers of antique cars are dying off? 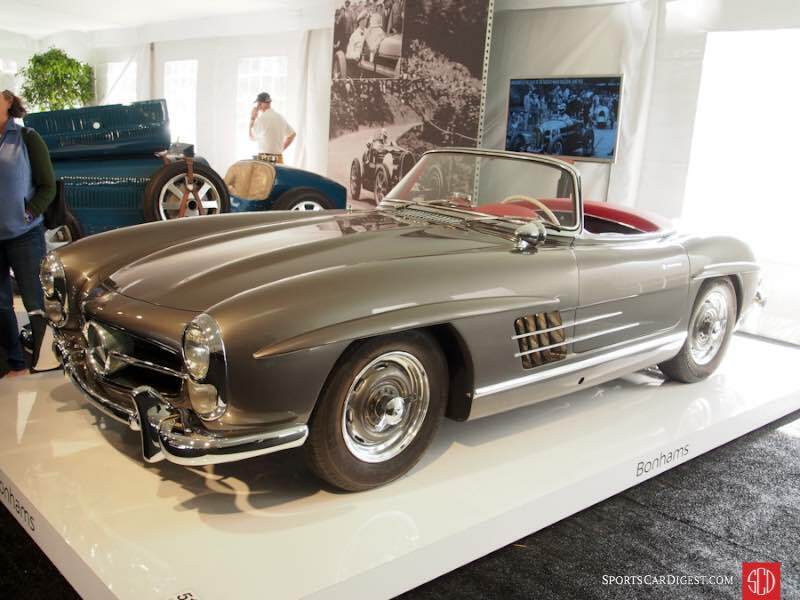 Lot # 51 1957 Mercedes-Benz 300SL Roadster; S/N 1980427500251; Engine # 1989807500269; Anthracite Grey Metallic/Red leather; Black cloth top; Estimate $1,150,000 – $1,350,000; Recent restoration, 2+ condition; With Reserve; Not sold at Hammer bid of $1,050,000 – Chrome rim Rudge-style wheels, Michelin blackwall tires, white steering wheel, US lights, pigskin luggage, factory build sheet, owner’s manuals, tool set, wheel hammer, workshop manual, parts book, brake manual, original keys. – Represented as the original matching numbers engine. Excellent paint, chrome and interior. Freshly restored and better than new. Engine compartment is freshly done with factory finishes and fittings. Better than new without being overdone. 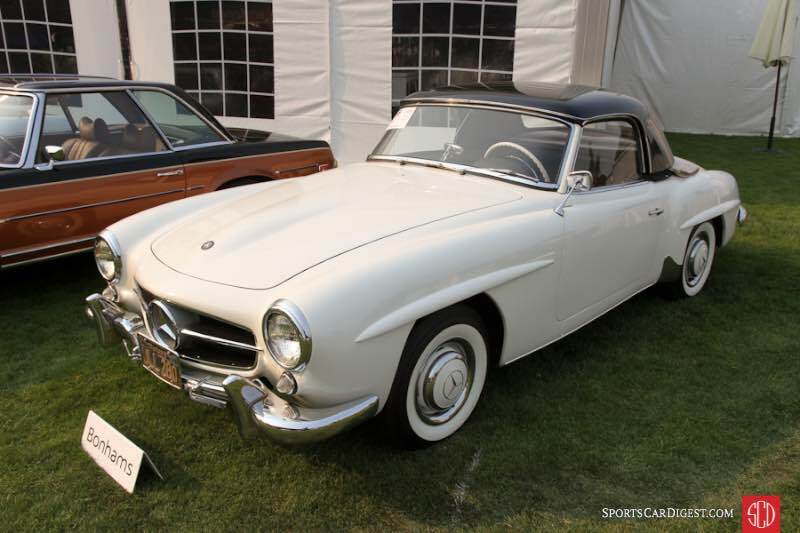 – The 300SL market is not what it was and the bid here was closer to appropriate than the seller’s expectations were. Lot # 96 1957 Mercedes-Benz 190SL Convertible; S/N 1210407502449; Engine # 1219217502470; Ivory, Black hardtop/Black leather; Black top; Estimate $125,000 – $150,000; Cosmetic restoration, 3+ condition; No Reserve; Hammered Sold at $105,000 plus commission of 10.00%; Final Price $115,500 – Hub caps and trim rings, Coker Classic whitewalls, Becker Europa radio, black cloth tonneau cover, VDO dash clock, CA black plate, two tops. – Titled as a 1958. Left front trim ring doesn’t fit straight. Driver’s side door sticks out at the bottom. Lightly worn original steering wheel, dash and switchgear. Very good newer upholstery. Dull bumpers. Lightly pitted original brightwork. Decent re paint. Light scratches on windshield. Has gotten serious cosmetic attention during the past few years, but never fully restored. Far from the best 190SL out here, but not bad. – After a sharp rise, 190SL values have settled and this price for a solid driver is as appropriate as it was a year ago. 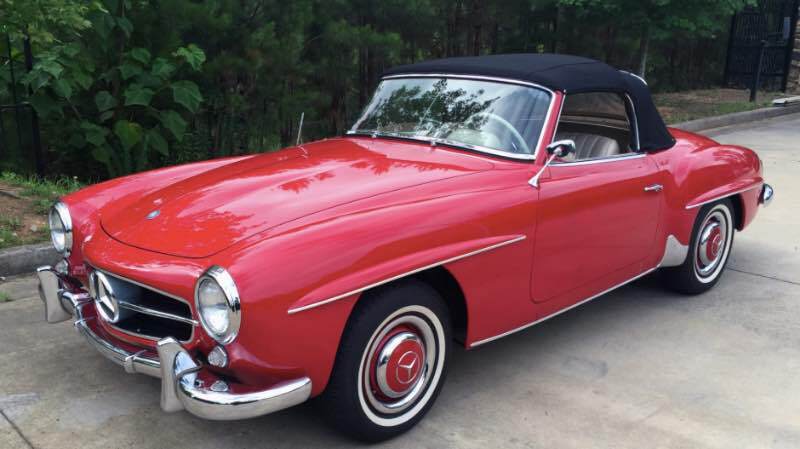 Lot # T108 1959 Mercedes-Benz 190SL Convertible; S/N 1210407502462; Red/White; Black top; Older restoration, 3+ condition; Not sold at Hammer bid of $140,000. With Reserve. – Power brakes, adjustable antenna, pushbutton radio, VDO dash clock. – Red paint was wet sanded and has been polished well. One very small scratch on the left front fender and a few other small ones near the driver’s door. Chrome was redone and is in very good shape. The windshield is delaminating. Engine compartment is clean with no leaks. Much of the rubber on the car is dry rotted and cracked. A stain is visible on the cloth that covers one of the top hoops, new carpet and a wrinkled driver seat. Gauges are clear and bright. An older body-off restoration that’s seen a fair share of enjoyment. – The reported high bid here wasn’t exactly generous for a 190SL in this kind of older restored condition, but it was enough to at least consider. These cars likely aren’t going to be getting more valuable any time soon, and that’s something the owner should consider before letting the car bounce from one Mecum auction to the next as he holds out for more. It was bought at Auburn Fall last September for $148,500 and isn’t likely to see that value again in the absence of some dedicated attention to its many and visible defects, and then it’ll represent an investment of $25-20,000 more, not an encouraging prospect. 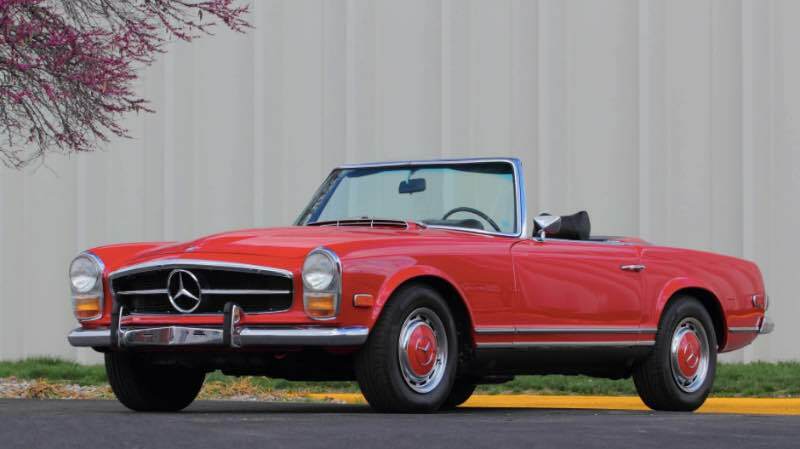 Lot #F77 1969 Mercedes-Benz 280SL Convertible; S/N 11304412006465; Signal Red, Red hardtop/Black leather; Black top; Estimate $95,000 – $115,000; Visually maintained, largely original, 3+ condition; Not sold at Hammer bid of $70,000. With Reserve. – Becker Mexico radio, dealer air conditioning, VDO dash clock, power brakes and steering, wheel covers, soft top and pagoda hardtop. – Single repaint. Normal chips near where the hardtop mounts. The bodywork is good. Panels are flat and most gaps are even, although the hood has a tight gap when closed and has large chips and rub through in that area. Chrome is a bit dull and lightly scratched. Engine bay is clean but older. Window gaskets are noticeably worn. Carpet is faded, but seat leather is new and well installed. Gauges are clear and bright. A good mostly unrestored driver showing 76,535 believable miles. – Sold at Mecum Kansas City last year for $65,880. In the same condition other than the newer seat upholstery, but new seats don’t justify refusing the reported high bid, which is higher enough than last year’s appropriate result to be perfectly happy with. These cars haven’t gotten any more valuable since then, either, so if there was money close to the high bid it should have been taken. 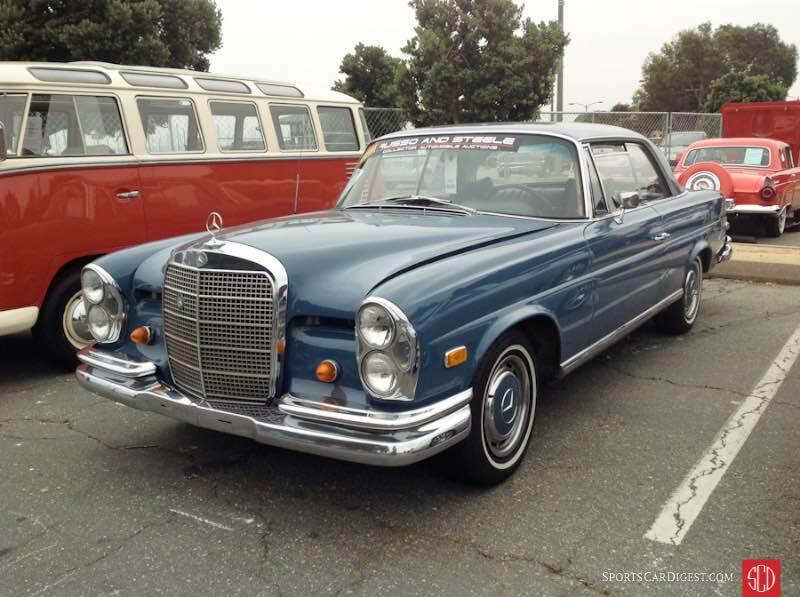 Lot # F456 1969 Mercedes-Benz 280SE 2-Dr. Hardtop; S/N 11102412002822; Blue/Blue leather; Visually maintained, largely original, 3 condition; Hammered Sold at $27,000 plus commission of 10.00%; Final Price $29,700. No Reserve. – Automatic, wheel covers, narrow whitewalls, wood dash and window trim, dash clock. – Repainted during the past few years with the old color evident along the seam of the driver’s side door and over-spray visible in the wheel wells. Brightwork is cloudy and lightly pitted throughout. The seats and carpet are in good condition. The leather pad is pulling up from the rear window ledge. It appears to have shrunk. Dash and steering wheel are worn and cracked. The Interior wood trim is in excellent condition. Newly rebuilt transmission and fuel injection system, and represented as a one-owner car. Well maintained and a usable driver, but not one to be especially proud to own. – Along with the car the new owner received a long list of projects to undertake between now and the 2017 driving season, a satisfying to do list to contemplate and plenty of reason to stay off the streets and out of bars in the coming months. It’s not a bad price for it, either, although the hasty repaint is and will remain troubling. 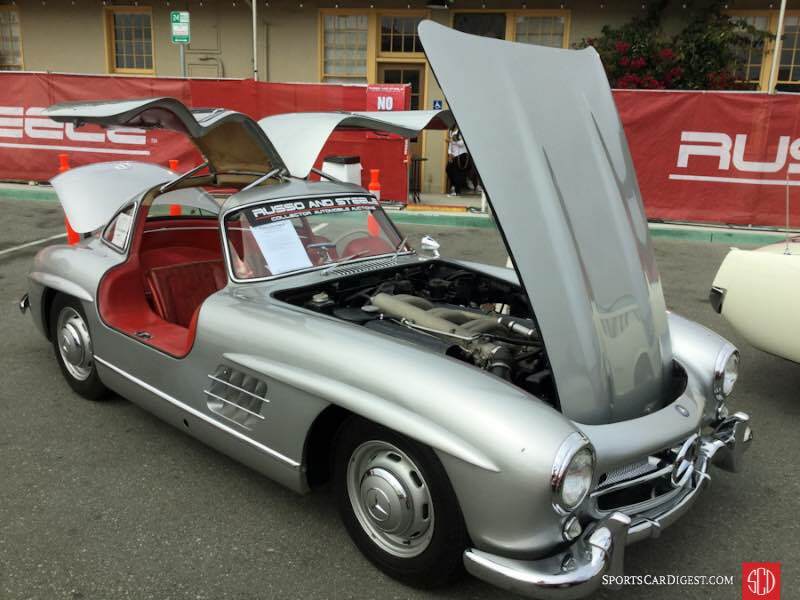 Lot # S678 1955 Mercedes-Benz 300SL Gullwing; S/N 1980405500548; Silver/Red leather; Visually maintained, largely original, 3- condition; Hammered Sold at $1,050,000 plus commission of 10.00%; Final Price $1,155,000. With Reserve. – Steel wheels with hub caps, VDO dash clock. – Originally ivory but now finished in silver. Very good paint and brightwork. The engine compartment has aged well and has little oil or grime. The underbody is the same story. The interior, is also original. The seats are very worn and stained, and the driver’s seat even has a rip on the top. Sills are very worn and the steering wheel is cracking. Very well redone on the exterior and worn well for the age inside. Repainted, but mostly original and represented with a recent service. – Cataloged here with an incorrect chassis number, 19804035500548, this Gullwing actually was sold by RM in Arizona in January of this year in the same tired condition for $1,155,000, exactly the same price it brought here.